$8.00 Guard's Badge, 1970s-80s. High quality Moscow Mint version in brass and enamels. Excellent unissued condition. Comes with original mint marked screw plate. $11.00 Guard's Badge, Pobeda Factory manufacture, circa 1970s. Excellent condition. $9.00 Honorary Badge "To a Warrior - Internationalist", 1980s issue. Most of these were awarded for service in Afghanistan. In excellent condition. $60.00 Tank Driver Proficiency Badge, 2nd class, 1954-1961. Attractive and relatively scarce piece in very fine condition. Included original maker marked screw plate. $10.00 Combined Arms Specialist, Master, 1960s-80s. $30.00 Excellent Soviet Army Soldier badge (for enlisted men and NCOs), circa late 1950s. Early screw back version in brass and enamels. In very fine to excellent condition. Includes original Pobeda Factory screw plate. $2.00 Proficient Army Serviceman (for enlisted men), 1970s-80s. $40.00 Army Proficiency (for enlisted men), Master, circa mid 1950s screw-back version in brass and enamels. Far better quality than the recent issues. Excellent example. $35.00 Army Proficiency badge (for enlisted men), 1st cl., circa mid- 1950s screw back version in brass and enamels. Marked "MMD" (Moscow Mint), this badge is of far better quality than the more recent issues. In excellent condition; includes original mint marked screw plate. $20.00 Army Proficiency badge (for enlisted men), 1st cl., late 1950s -1960s pin back issue in brass and enamels. Maker marked piece in very fine to excellent condition. $34.00 Army Proficiency badge (for enlisted men), 1st cl. A very unusual screw back version in brass and enamels made in the late 70s - 80s according to the early standards, this badge is of far better quality than vast majority of contemporary Soviet Army qualification badges. The reverse shows late style circular logo of the Moscow Mint. In excellent condition. $25.00 Army Proficiency badge (for enlisted men), 2nd cl., circa mid- 1950s screw back version in brass and enamels. Marked "MMD" (Moscow Mint), this badge is of far better quality than the more recent issues. In very fine to excellent condition and includes original mint marked screw plate. $20.00 Army Proficiency badge (for enlisted men), 2nd cl., uncommon "transitional" version in aluminum and enamels. This circa 1960s badge is of lesser quality than the early issues in brass but still noticeably better than the typical pin back qualification badges from the 70s-80s. In excellent condition. $20.00 Army Proficiency badge (for enlisted men), 3rd cl., circa mid- 1950s screw back version in brass and enamels. Marked "MMD" (Moscow Mint), this badge is of far better quality than the more recent issues. In excellent condition and includes original mint marked screw plate. $24.00 Army Proficiency badge (for enlisted men), 3rd cl. A very unusual screw back version in brass and enamels made in the late 70s - 80s according to the early standards, this badge is of far better quality than vast majority of contemporary Soviet Army qualification badges. The reverse shows late style circular logo of the Moscow Mint. In excellent condition. $2.00 Army Proficiency (for enlisted men), 3rd cl., 1980s. $90.00 Badge for Excellent Artillery Shooting, Type 2, 1946-1952. Excellent condition. $10.00 Badge for Extended Service in the Army, 10 years, circa 1970s-80s. Excellent condition. $20.00 Extended Service in the Army, 2 years, 1950s-60s issue. Early version in brass and enamels. $45.00 Badge for Good Memory from the Soviet Armed Forces, Type 1 (with smaller red star and rocket launcher), circa 1960s - 70s. Near mint condition. $60.00 Badge for Good Memory from the Soviet Armed Forces, Type 2 (with larger red star, tank and rockets), circa 1960s - 70s. In very fine condition. $80.00 Badge for Good Memory from the Soviet Armed Forces, Type 3 (with larger red star and rocket launcher), circa 1960s - 70s. In very fine to excellent condition. $4.00 VLKSM Membership, military issue screw back, 1970s - 1980s. $35.00 VLKSM Badge for Distinction in Military Service, 1988-1991. $5.00 Military Police Patrol, Large breast badge, circa 1980s. 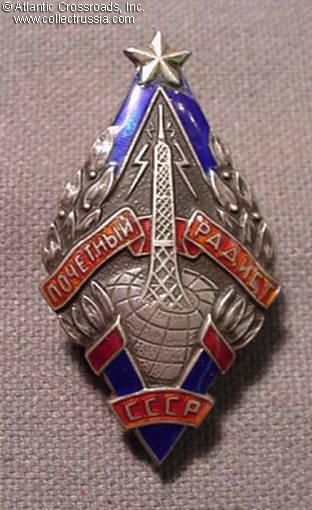 $80.00 Badge of a Participant of the 1958 DOSAAF International Shooting Competition in Commemoration of the 40th Anniversary of the Red Army. Scarce and attractive badge in excellent condition. $2.00 Military Sportsman badge, 1st cl., 1966 type, late 1960s - 1980s. Excellent condition. $5.00 Military Sportsman badge, 2nd cl., 1966 type, late 1960s - 1980s issue. $20.00 Sportsman, 3rd cl. badge, 1950 type. Unified type preferred by the military. $70.00 Badge of a Participant of the 40th Conference of the Warsaw Pact dedicated to the 20th Anniversary of the Military Council of the [Eastern Block] Joint Forces, 1989. Very large and extremely uncommon badge issued to one of the high ranking members invited to the conference. In excellent condition. $90.00 Badge of a Participant of the 41st Conference of the Warsaw Pact, 1990. Extremely uncommon badge issued to one of the attendees of the last conference of the Warsaw Pact before the dissolution of this organization early next year. In mint condition and comes sealed in original plastic pouch. $30.00 Warsaw Pact Military Exercise Shield-82, participant's badge, 1982. $40.00 Badge for Mine Clearing, circa mid 1970s - early 80s issue. Pobeda Factory maker marked on the suspension. In excellent condition. $15.00 Badge for Mine Clearing, mid- to late 1980s issue. In excellent condition. $6.00 Badge for Excellence in Military Construction, circa 1970s- 80s. Nicely made piece in brass and enamels. $50.00 Large Medal of the IV All-Army Tourist Rally in Commemoration of the 40th Anniversary of Victory over Germany, 1985 issue. Very attractive massive piece in brass. Excellent condition. $275.00 Shooting Competition Award Badge "For Good Memory from the Soviet Army", Estonian version, 1959 issue, with original issue case. The badge is of spectacular quality badge and in excellent condition. $8.00 Southern Army Group Veteran Medal, 1956-1991	. In brass and enamels, mint marked. Shows Soviet and Hungarian flags. A very interesting memento of the end of Soviet occupation of Eastern Europe.